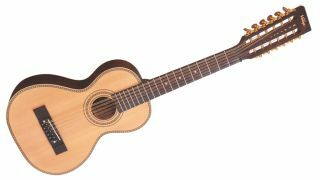 The original Viator and Viator USB are nifty twists on the compact acoustic theme, so we're pleased to see the addition of a 12-string to Paul Brett's stable. As well as those six additional strings, the Viator 12-string boasts a solid Sitka spruce top and sapele back and sides, plus a nato V-shape neck with rosewood fingerboard. Elsewhere, a Graph Tech NuBone nut is onboard, as is a Fishman Sonitone pickup system with soundhole-mounted preamp system and USB output. You can hear the guitar in action in what we assume is Paul's gloriously arranged garden above. Handy for the shimmer-loving guitarist on the move, this. The Vintage Viator 12-string is available now for £349.